The sector taken over by the 50th Divn was immediately to the right of the one held the previous November, and from which the Butte de Warlencourt was attacked. The 151st Bde was on the right flank and the 149th Bde on the left. The following officers of this Bn were the recipients of awards in London Gazette. A great deal of work was carried out improving the condition of the trenches in Turk Avenue and Yarra Avenue. Turk Avenue, Yarra Avenue and North Road were shelled intermittently with 5.9s. The guns appear to be a long way off and fire from the direction of Le Barque. One officer and fifty men carried stores up to Yarra Bank at night. The whole area occupied by the Bn was shelled intermittently. The junction of Yarra Reserve and Yarra Avenue was heavily shelled with 5.9s between 8am and 9am, with the first direct hits on Yarra Avenue. Work continued on reclaiming and improving trenches and shelters. One officer and fifty men carried duckboards up to the front line at night. A considerable quantity of material was salvaged by the Bn. The Bn relieved the 6th Bn in the front line at about 5pm on the 3rd. Artillery fire did not affect relief, but a machine gun was turned on the last platoon relieving on the left sector. ‘B’ Coy took over the right sector (posts 1,2,3,4) from Yarra Bend to M.24.b.6.6 (Sheet 57c S:W). Three platoons from ‘D’ Coy took over left sector (posts 5.6.7.8) from the left of ‘B’ Coy (after a gap of about seventy yards to M.24a.2.9. From there, there is a gap of about sixty yards at the end of which the 6th Bn have their right post. The trenches were in a bad condition and a good deal of time was spent during the night in improving them. The enemy is at present very quiet on our front. A few fishtail bombs landed behind and on the left flank of ‘D’ Coy during the night. A party of SNCOs and thirty-two men carried wire and material to build revetments to the front line. One man killed and one wounded. The 4th was a quiet day in the front line. The enemy walks about in the open during the day at times and waves to our men. Fifty yards of wire was put up in front of Yarra Bank. An enemy relief was expected and patrols were sent out from ‘B’ and ‘D’ Coy. One of the ‘D’ Coy patrols reported that relief seemed to be taking place and that a large party of the enemy were moving down Bayonet Trench. Our artillery paid attention to this relief. 5.30pm Cobham Trench was shelled as usual. Message sent to Artillery that an enemy working party were working at a trench to the rear of Maze M.24.b.8.5. to M.24.b.3.9. Artillery replied about 6pm with salvoes of high explosive and shrapnel, which appeared to be effective. Work was carried out draining and wiring the right sector. One hundred and fifty yards of wire was erected and two drains were dug, one of which was revetted. At 5pm ‘D’ Coy were relieved by three platoons of ‘A’ Coy in the left sector. Three platoons of ‘D’ Coy went to Cobham Trench. In the right sector three platoons of ‘B’ Coy were relieved by an 'A' Coy platoon from Cobham Trench, a 'D' Coy platoon from HQ and a ‘B’ Coy platoon which previously had only been acting as a carrying party. Two platoons of ‘B’ Coy came to HQ. The remaining platoon of ‘B’ Coy remained at Yarra Bank as a carrying platoon. On the 6th, work continued at night on Yarra Bank. The whole of the front of Yarra Bank was rewired in front, and the proposed support trench was sited and taped out. Four drains were completed and revetted. On the left sector the trench was cleared out and dried after last nights rain and ten duckboards put in. At 10.30am, the artillery was informed that an enemy working party was working in front of the Bn left sector. It was dispersed. This was repeated with another enemy working party at 10.45am. Minenwerfer from long range fired behind No 9 post. Otherwise enemy was quiet in the front line. Cobham Trench and the junction of Yarra Reserve and Yarra Avenue was heavily shelled as usual. On the 7th of Jan a certain amount of work was done on drains through Yarra Bank during the day. At 5.30 the Bn relief by the 5th Bn Yorkshire Regt began. It was completed by 8pm without casualty. The Bn proceeded by Coys to Nissen Hutment Camp No5 at Bazentin Le Petit. The 8th was devoted to cleaning equipment and rifles etc. Coy inspections of general turnout took place and returns of requirements with regard to clothing and equipment were rendered to OR. One NCO and twenty men at Clarks Dump S.3.R.4.7 reported to 1st Northumbria Field Coy RE to push Tanks to M 30 C.4.0. 7pm One NCO and 20 men at Clarks Dump S3d.4.7 at 7pm to representative of 179th Tunnelling Coy RE to push trolley to Factory Corner or Flers Dump. 1pm One NCO and 25 men to report Clarks Dump at 1pm. 4pm Two officers and all the remaining available men (120) to RE Bde HQ. 150th Bde at Cough Drop at 5pm for buried cable laying. The 10th Jan was very cold, a north wind was blowing and it was trying to snow. 1 NCO and 25 men to report to Clarks Dump at 2.30pm. 4pm 1 NCO and 20 men to report to Clarks Dump at 4pm to push trucks to M.30. c.4.0. 7pm 1 NCO and 25 men to report to the above mentioned place to push trucks to Factory Corner. 5pm All available men of Coys including officer servants save two per Coy and two officers (2nd Lt Johnson and Burton) to report to RE Signals Bde HQ at Cough Drop for cable burying – Shovels drawn at BP Dump. Very cold, north wind, trying to snow. 4pm 26 NCOs and men reported at Clarks Dump. 7pm Another party same strength for Clarks Dump at 7pm with haversack rations. 6pm One NCO and 8 men to report to 179th Tunnelling Coy RE to load trolley’s at Bazentin Circus (S 8 d 8.0) with Haversack rations. 1 NCO and 25 men at High Wood Siding S3d4.7 at 1pm to report to representative of 179th Tunnelling Coy RE. 4pm One NCO and 25 men at Clarks Dump S.3.d.4.7. at 4pm to representative of 1st Northumbria Field Coy RE. At 12 noon Brigadier General Owens inspected the Camp huts. 4pm 1 NCO and 16 men to report at Clarks Dump. 5.30pm 2 NCOs and 28 men including L/Cpl to Seven Elms Dump at 7pm – with ‘H’ rations. 6pm 1 NCO and 20 men to report at BP Dump (Nr Langly Circus) at 6pm. 1 NCO and 8 men to report at Bazentin Circus at 6pm with haversack rations. 7.40 NCO and six men to report at High Wood Sta (Near Clarks Dump). The usual working parties were found on the 14th Jan.
At 4pm the first Coy left for the trenches to relieve the 5th Bn Yorkshires in the same support trenches they were in on the previous tour of duty. 7pm Relief reported complete. ‘A’ Coy went to Turk Alley, which was improved during the night. ‘B’ Coy to North Road dugouts and shelters. Two platoons of ‘C’ Coy went with ‘B’ Coy, one platoon with ‘A’ Coy and one platoon in part of Yarra Avenue, which was cleared. ‘D’ Coy was left at Canvas Camp Bazentin on this occasion. The whole day was very quiet. Working parties were provided during the evening for work on Yarra Bank. They carried up material from Turks Dump and worked on communication trench from Yarra Bank to right sector Coy HQ. Heavy snowfall during the night of the 16th and 17th. was followed by a slight thaw during the morning – Turk Alley was cleared of snow. Dugout and snow shelter entrances there and at Yarra Avenue were cleared. freezing hard at night. Usual working party was found for Yarra Bank. Work was better organised and more was done to drains through Bank and revetting of communications trench commenced. Hard weather held with a slight increase of snowfall during the morning till 11am. Work on new Aid post in Turk Alley next to Coy HQ commenced. Working parties were sent to Yarra Bank as usual and good progress made with drains through Yarra Bank and revetting and duck boarding of communication trench. A heavy fall of snow, bitterly cold on the 19th. Work on Turk Alley and new Aid Post during day. At 5pm ‘C’ & ‘B’ Coys went up and relieved the 5th Bn, ‘A’ Coy, relieving Coy from the 5th at Cobham trench and dugouts. The 20th was quiet in the front line – Usual amount of intermittent shelling around back areas. ‘C’ Coy did much work on posts and trench revetting and duckboarding and erecting shelters. Working parties from the 5th Bn worked on communication trench and Yarra Bank during day and carried up a large amount of material for continuing work on left and right Coy sectors. The ground was still hard and dry on the 21st. Work continued on Bank and much progress made with conditions of posts on left sector. At 5pm ‘A’ Coy relieved ‘C’ Coy on left sector. ‘C’ Coy going back to Cobham support trenches. The relief was complete by 6pm. Work continued on Yarra Bank drains – one or two finished and 35 yards of communication trench revetted and duckboards by morning. At 1pm on the 22nd the enemy commenced …………….. around left post of left Coy, Sector. He followed this up with a battery of guns firing 8” around and in rear of post also on posts of Bn on left. At 1.40pm this firing ceased. One case of shell shock resulted. Much work done on both sectors. During morning of the 23rd enemy warned left Coy sector with fish tail bombs ceasing after a short period. At 6.30pm relief of the Bn by the 5th Bn Yorkshires began and despite the conditions were very bad it was complete by 8.15pm. The Bn proceeded to Mametz Wood Camp. 6.30pm Day spent in cleaning up and preparing for next days move. Working party of eighty found for carrying and pushing about Clarks Dump. At 10am on the 25th the Bn marched to Albert – Fair and were billeted in Rue De Boulan. No baths available owing to frost holding. After parade held inspections etc. CO inspected Coys in billets. Training continued. During aft GOC inspected Bn in billets. Training parades held during morning. At 8.30pm on the 29th the Bn marched approximately 2.5 miles to billets in Canterbury Street, Dernancourt. In the afternoon Coy inspections and parades were held till 3.30pm. A Bn canteen was established and opened same night. Training on ground ‘B’ allotted was carried out tho weather being extremely cold did not permit of full programme of training being observed. 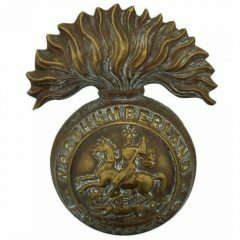 50th (Northumbrian) Division - Consisted of the 149th (Northumberland) Bde, 150th (York & Durham) Bde and 151st (Durham Light Infantry (DLI)) Bde. The 149th Bde was comprised of the 1/4th, 1/5th, 1/6th and 1/7th Bn - Northumberland Fusiliers. The 150th Bde was comprised 1/4th Bn - East Yorkshires, 1/4th Bn - Green Howards, 1/5th - Bn Green Howards and 1/5th Bn - Durham Light Infantry. The 151st Bde was comprised the 1/6th, 1/8th, 1/9th Bn - DLI and 1/5th (Cumberland) Bn - Border Regt.